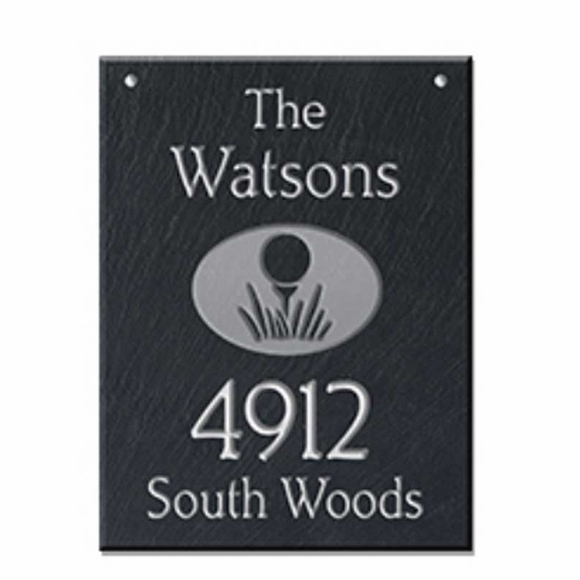 Hanging Slate Address Sign with Golf Ball - - personalized golf theme address sign features a large golf ball in the center. Vertical orientation. 12" x 16". Custom made for you. Made in USA. Designed to hang from your own bracket or the optional Stone Mill wrought iron bracket (Comfort House item #66616F). The one-sided sign has the name & address you supply and the golf ball on the front only. The two-sided sign has the name & address you supply and the golf ball on the front and the back. (Note: personalization is exactly the same on both sides). The word "The" at the top is standard on this sign. Hang on a post close to the road for excellent roadside visibility. Perfect for homes owned by golfers and for golf related businesses.